From US-31, turn west on Rosy Mound Drive, then south on Lakeshore Avenue to the park entrance. *Barrier free facilities include parking lot restrooms, picnic tables and grills. Some trails are wheelchair accessible and all stairs are designed to be ADA accessible. This map shows amenities, parking areas, features and trails. 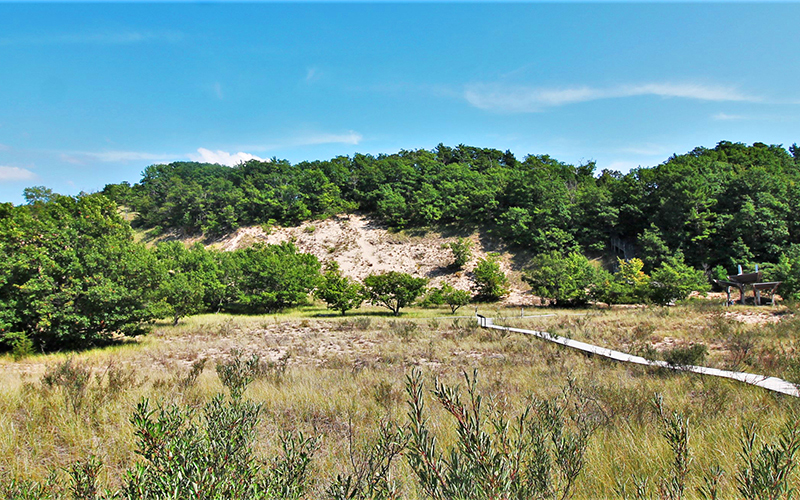 Rosy Mound is a classic Great Lakes dune system including high wooded dunes, foredunes, beach and a dune blowout. 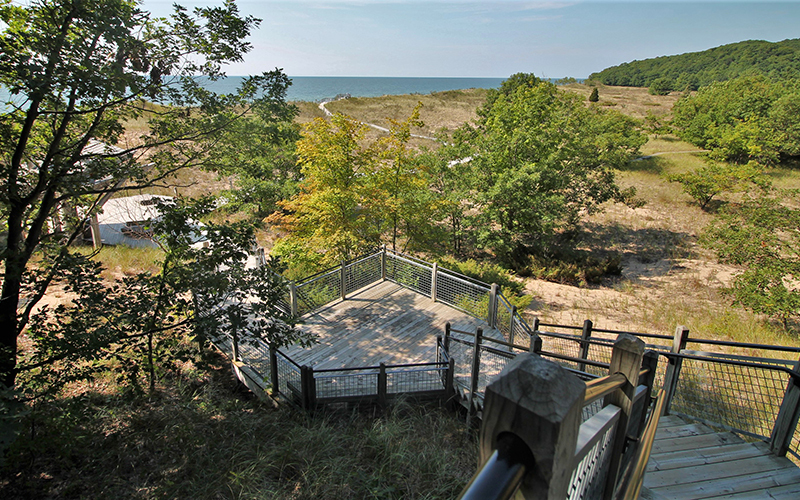 A 0.7 mile hiking trail from the parking area to the Lake Michigan shoreline includes 1,000 feet of stairs up and down the dunes and scenic views. 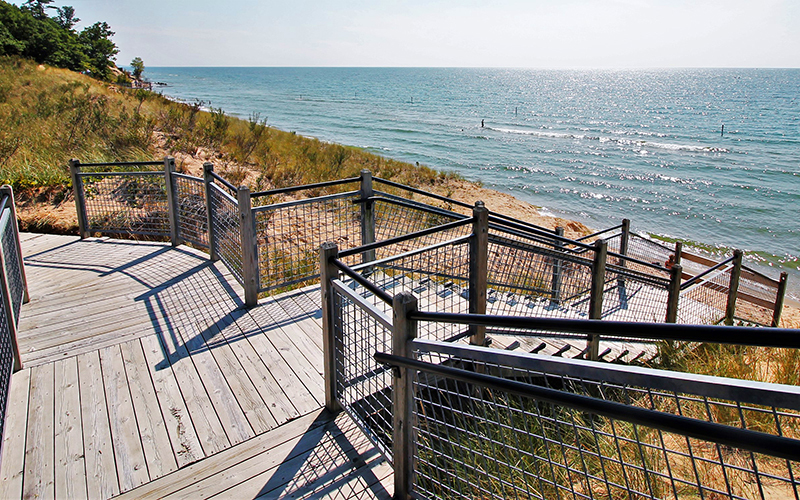 A unique shade canopy, dune boardwalk trail and rustic toilets are located near the beach. Motor vehicle parking fees are in effect from Memorial Day weekend through Labor Day. Please note that a Michigan “Recreation Passport” is not valid at County Parks. Rosy Mound Natural Area has a self-service fee station selling $7 daily permits regardless of residency. Annual permits are not available at the self-service fee station, but can be purchased at Kirk Park which is 5 miles south on Lakeshore Drive. Annual permits are $15 for County residents and $25 for non-residents. Those failing to display a daily or annual motor vehicle parking permit risk being ticketed. More about motor vehicle parking fees and permits. Dogs are not allowed at Rosy Mound. Leader dogs for persons with disabilities are permitted. 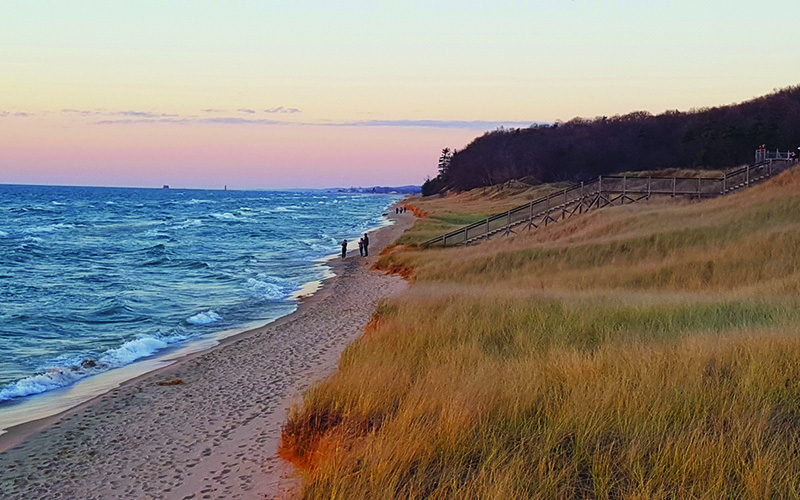 Ottawa County Open Space Lands allow dogs off leash to run and play freely, so be sure to read about these sites. Dog policies vary from park to park, so please check each park's webpage carefully for rules. If you would like to take your dog to the beach, consider visiting Kirk Park’s off-leash dog beach.